How Aaron Baddeley won … | Thermal Technology Services Inc.
“With their graphite-shafted, jumbo-sized metal drivers, 80-degree wedges and their swing gurus at their elbows, you might have thought that there was nothing more modern-day golfers could do to gain an advantage over a golf course. 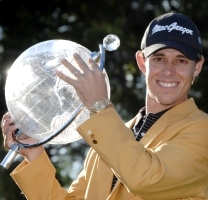 However, when 18-year-old Victorian amateur Aaron Baddeley stepped onto the tee to start his challenge for the Holden Australian Open at Royal Sydney yesterday, few people realized that the driver in his hands was more than just another metallic grey monster. It looks like any other modern driver, but it’s what you can’t see that holds the secret; a secret he now shares with none other than world No. 1, Tiger Woods. Baddeley’s club has been treated with what is literally space-aged technology.